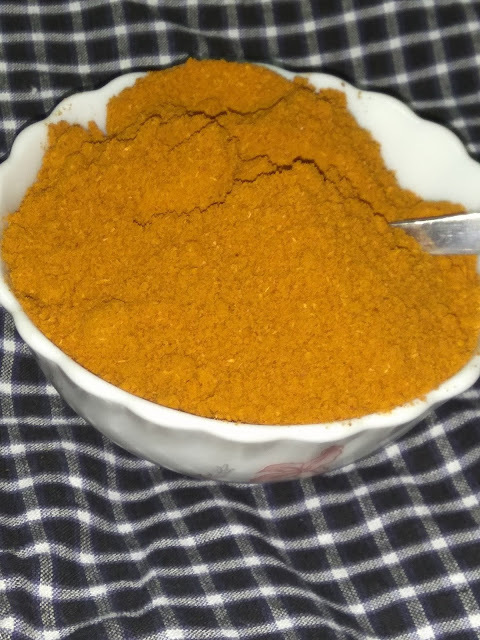 Sambar powder is prepared in every home of kongu folks in bulk for sharing the powder to their married daughters, sisters and other relatives.The process is passed generation to generation to sustain the traditional method. 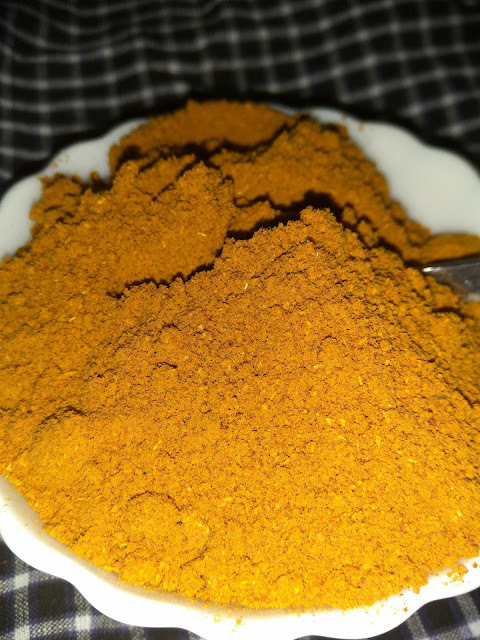 This sambar powder enhances the taste of sambar, kootu, Porials, pulikuzhambu of south Indian recipes. This flavourful and fine aromatic powder helps to every house wife to make sambar in a jiffy. The perfect blend of aromatic spices is the staple component of every kongu cuisine. when the harvesting season starts, all the spices are being sold in every grocery store in cheap rate. We usually purchase all the spices well in advance in bulk. We sundry the spices such as dry chilies. curry leaves, coriander seeds (country), cumin seeds, pepper seeds, raw rice, fenugreek, seeds, chana dal, urad dal, asafoetida, Toor dal. Then, we clean them and collect them in a plate. Then dry roast every ingredient except curry leaves and red chilly. Then pour castor oil one spoon in a pan and roast the red chillies and curry leaves.in the right proportion and blend them into the powder in fine texture in a mill. After blending, the powder is being mixed with one spoon of castor oil and stored in an air tight container. Now how to make perfect kongu sambar powder here. Heat one table spoon of castor oil in a dry pan and roast the red chilies. Then curry leaves to be roasted. Care should be taken to avoid burning. Fry the asafoetida block and break into pieces to white texture. Dry roast all the ingredients to a golden brown colour.one by one. Now the dry roasted ad roasted ingredients are ready to be ground in a mill. Heat the castor oil and mix with the sambar powder. Castor oil is acting as a preservative and supports aroma. The sambar powder should be stored in an air tight container.